And now for an important update about today’s Wolf Pack Lunch. Your teachers have selected honorees from every grade and every team. These students embody all the best that Williamsburg has to offer– and have earned themselves a free pizza lunch with our WMS administrators. 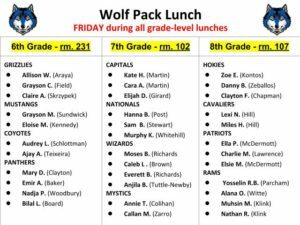 But please note that the room locations have CHANGED — 6th grade will be in room 231; 7th grade in room 102; and 8th grade in room 107. Please DO NOT go to the cafeteria first; but go directly to your assigned room. We can’t have the party without you! See Ms. Mays or your TA teacher with any questions. The Best Buddies Club is meeting TODAY for fun-and-games during Wolf Time in room 108. Members and allies are invited to come make friends — and make a difference with some amazing kids. Plus, Best Buddies will be kicking-off its Hot Chocolate fundraiser — taking place every Friday morning through February. Just remind your TA teacher to sign your class up. See Ms. Rogers with any questions. Thanks, Buddy!! The Williamsburg SCA — our Student Council Association — will be meeting TODAY during Wolf Time in room 215. All officers and representatives are expected to attend. See Mr. Taggert or Mr. Peacock for more information. And now for an update on the WMS Spring Musical — “Alice in Wonderland, Junior!” Both the TECH and STAGE readings have been rescheduled for next THURSDAY, January 31st during ASP 1 and 2 in the auditorium. This will be a COMBINED REHEARSAL for EVERYONE involved with the show. See Mr. Brown for more information or with any questions. Break a leg! And now for an important announcement for all 6th and 7th graders who will be attending the new Dorothy Hamm Middle School next year. Mrs. Smith — the school’s principal — will be hosting an assembly on TUESDAY during Wolf Time in the auditorium. She’d like to meet her new students — and share some EXCITING information about the new school — including a discussion about school colors and the selection of a school mascot! TA teachers have a list of everyone who should attend. And for all you kids who are staying here at WMS next year, Tuesday is now a PASS DAY — so you can just kick-it in your TA. That’s all for now, but stay tuned for the 2nd Quarter WOLF PAW DRAWING — coming up immediately following the Morning Announcements. If your name is selected, please come to the main lobby and claim your prize!